June is here and with it—Hurricane Season. For all of us in Florida, that means it’s time to get prepared, including stocking up on supplies and doing what’s necessary to keep our families, our homes and our valuables safe. While preparing, it’s important to give consideration to the many documents that you have that contain sensitive information as well as those that you’ll need in the future—including birth certificates, passports, medical records and insurance papers, estate planning and wills, among others. If there’s flooding in your home or office, these records could be damaged or destroyed and if you have to evacuate, there may be no time to secure them properly. Here are some steps to take at the start of hurricane season to protect these and other documents. The first thing to do is to make a list of all the documents and records that you have and then, make copies. If possible, make digital copies rather than paper—a thumb drive or disc is easier to keep and eliminates a longer paper trail. Even better, take pictures of docs like birth certificates, social security cards, insurance cards, medical insurance papers, etc., that way you have immediate access to them on your cell phone. For original documents like birth certificates, social security cards and others, it’s best to place them in a waterproof container or a safe and then store it high up in a closet or offsite. If you have a safe deposit box or a friend or relative that lives outside the impact zone of the storm, take your containers over there for the duration to ensure they’re safe. 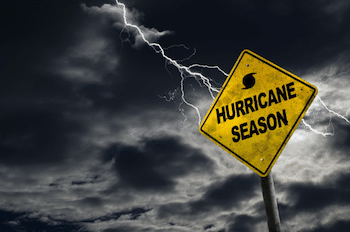 When preparing for hurricane season, it’s also a great time to get rid of old documents that you no longer need by shredding them. Especially if you have paperwork that contains personal information that could fall prey to an identity thief. Things like old tax returns, medical records from year’s past, bank and credit card statements, etc. should be copied digitally, then destroyed. The last thing you need after dealing with a hurricane is having your confidential information stolen. Although ensuring you and your family have all the necessary supplies like water, batteries, non-perishable food and first aid supplies is critical to hurricane preparation, protecting your personal documents is also extremely important. Take these steps at the start of the season so you won’t have to worry about them getting destroyed in a flood—or falling into the wrong hands. All Points Mobile Shredding can help you with all of your shredding needs. We’re a full service, family-owned and operated company that serves residential and commercial clients. In addition to onsite shredding of all your documents, we also offer destruction of old hard-drives and other devices that contain personal information. Give us a call today at 772.483.4152 or fill out our quote request form to find out more. ← Could your personal documents end up as confetti?